I know, these two things just don't have anything to do with each other, but I feel I have to mention how historic a day it is, while still giving a nod to my wonderful weekend. Watching the inauguration, today, I couldn't help but sob with the immensity of the day. Whatever your political leanings, there is no doubt that the swearing in of the first non-white president is an historic day for the US and I'm proud to be alive to experience it. Can the day be too far away when all these matters are as trivial as hair color? Should it matter what someone's gender, religion (or lack there of, thankyouverymuch,) sexual preference, or nationality is? Wouldn't it be grand to judge people on their, I dunno, credentials and a strong ethics? Crazy, I know. I'm going to go out back and hug a tree now. Speaking of which (that's a segue, people,) we saw some grand trees this weekend on our hike to Falcon Cove. We hiked a total of about 4 miles after a bit of fetch on the beach, and we actually managed to tucker out the herding dogs which is no small feat. It was absolutely beautiful, a bit muddy and completely exhausting and I can't wait to do it again. 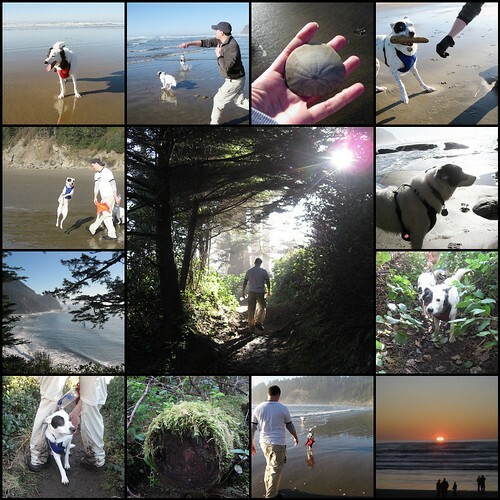 See all the pictures from our hike here. It feels like I haven't done too much lately. Work has been one crazy deadline after another and by the time the day is up, not even my crafting looks appealing to me. I have made some incremental progress on the cotton cowl. I think you might even be able to make out some of that bleached effect, in these pictures. It's noticeable to me, but I've been staring at it for a couple weeks. I've also purchased a few new tatting supplies. I bought two balls of variegated thread, and three new shuttles. So far, I like the little hooks at the end of the Boye shuttles (the ones with the bobbins) but I find my original Clover plastic shuttles a little nicer to hold, because they are so light. It doesn't seem like the bobbin holds much more of the #5 pearl cotton, but I'm sure its fantastic with fine threads. The pretty little silver shuttle is lovely to look at but with no hook or pick at the end, it requires that I always keep a fine crochet hook around for joining picots and that's just a bit of a drag. I also got myself an inexpensive little picot guide (not shown). If I ever make anything that could be an heirloom, it'll sate my persnickety side that wants everything to be just right. 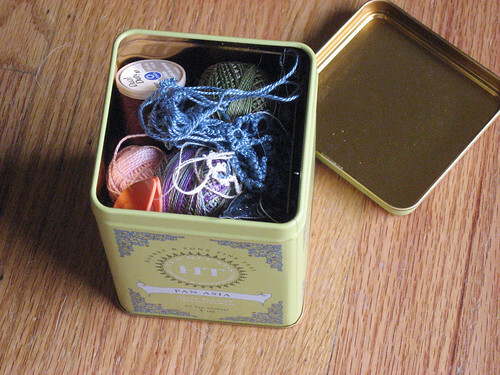 My humble little tatting collection all fits snuggly in a tea tin, right now. I'm not sure how long that will last, but I like it for now. Since I've started working from home, I've gradually moved from being a coffee drinker to being exclusively a tea drinker, and I have many little tins and containers to prove it. Any opportunity to put them to good use fills me with a bit of glee. 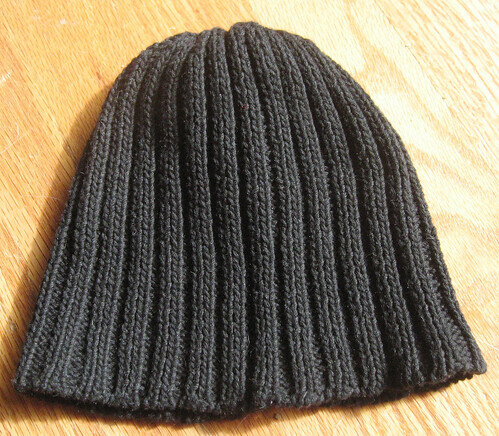 Lastly, I've finished Leo's second beanie. I've had this done for a while but black knits are a real beast to photograph and I've been dragging my feet on it. I still want to knit him at least one more hat, in something easy to care for. The pima/silk blend is a delight to knit and wear, but he needs some real work horses to keep up with his beanie wearing schedule. 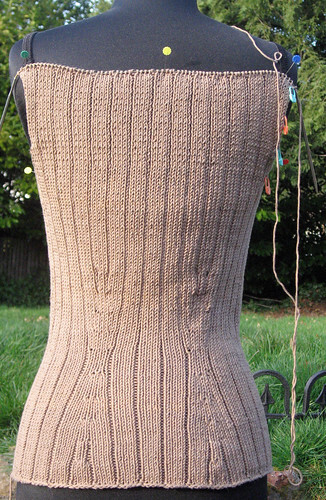 About a year ago, I bought a sweater's worth of Elsbeth Lavold Cotton Patine. It was on sale at an LYS and it was so soft and squishy, I just couldn't pass it up. Well, despite the fact that I've had it tucked away in a dark corner, in a bag, the yarn is showing definite signs of fading from exposure to sun. It's subtle enough, that I can't seem to capture it in photos, but when I try the garment on, I see obvious bands of fading at the start of each new ball of yarn I add. The effect is one of belly cellulite. I'm quite sure that this is not a look I want to go for. 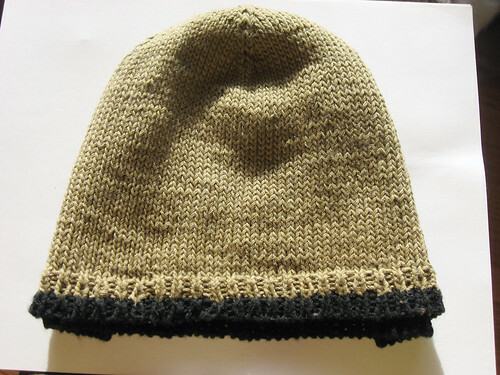 But, even though I noticed this a while ago, I didn't stop knitting it. In fact, I'm plowing along. Why? Because I have a really sweet mum. She's going to over dye my piece, when I'm done, to even out the coloring. She's been dying natural fibers, at home, and graciously agreed to throw turn my brown eyes garment, blue. I'm sort of giddy about it. I think that the end result will look even better than if my yarn had been perfect to start with. I didn't have a chance in my earlier post, to put up a picture of my Inspir(al)ed hat, but now that I'm back home I can show you this picture of Inspir(al)ed, having a moment with Thea and me. It's good to have an assistant. I'm back to using the size 8 pearl cotton (the finer stuff). I just love how delicate it looks, next to the size 5 cotton. I'm a painfully slow tatter. That image above shows several hours worth of work. 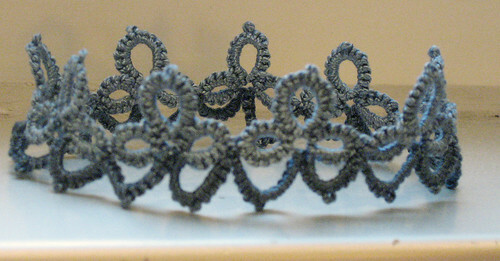 But I have these visions of trimming projects in tatted lace and I get so excited, I just can't put the project down. By the way, thanks to each of you who sent me resources and suggestions. I've been trying to take it all in and I know I'll be coming back, again and again, to revisit your comments and links. 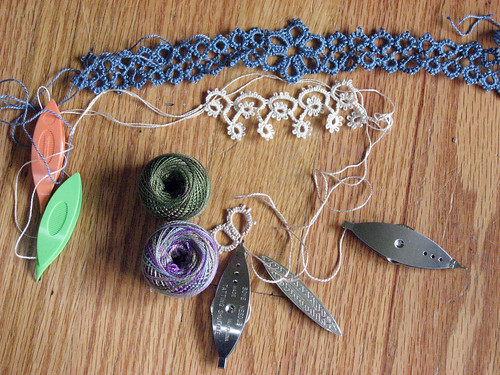 I may have ordered myself some more tatting goodies from an online resource. I've used this site for purse handles, and now it's becoming my go-to place for tatting supplies. After an all morning meeting, my head is swimming but I was able to secure a spot on an earlier flight, so barring any unforeseen issues I should be back home before everyone is in bed. On the one hand, it'd be so nice to have a couple days to see Chicago, but on the other hand, I sure do love being home. I bet you can guess why. 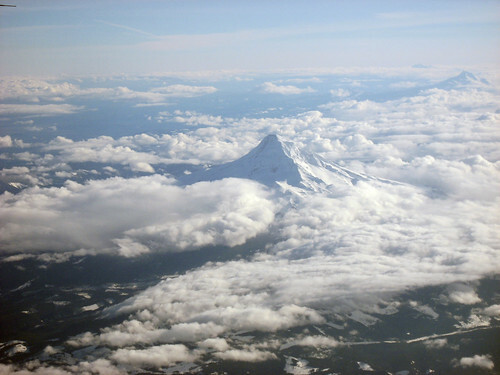 Flying out was pretty turbulent with plenty of delays, but the view was grand. I kept myself pretty entertained on the flight. First, I finished tatting that little flower design I was making. 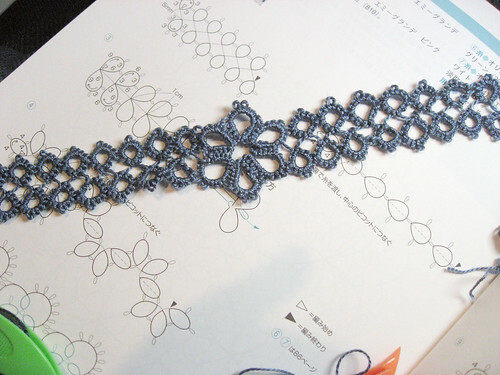 It's a simple choker based on a couple different motifs in my tatting book. I'll pick up some findings and finish it off, eventually. I learned a lot working on this. I don't really have any need for a tatted choker, but forcing myself to create a project help me to perfect some of the techniques. Once that was done, I started on a slightly more complicated border. This version uses two different colors instead of the single color and single strand design of the choker. I think I want to use this as the top trim on a little evening bag, something just big enough to hold an ID, and some cash. 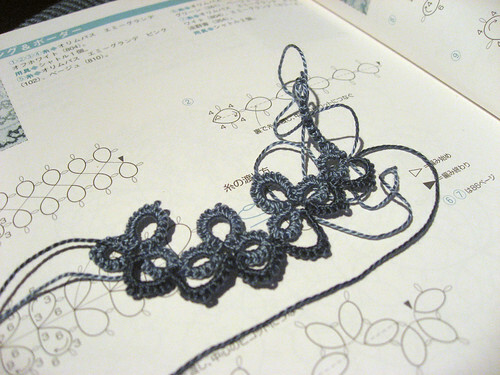 Now I'm thinking I want more tatting books. Evil little craft. The one thing I find a little challenging, right now, is starting a new thread, when the shuttle is empty. If any of you tatting experts have links to a good description, I'd love to know. It seems like the thicker the yarn, the harder it is to join a new thread, but that could just be my ignorance. I've been working on lots of little things lately. 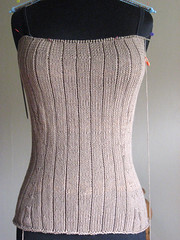 There's a bigger item on the needles too, but I haven't had the time or mental fortitude to tackle it recently. Firstly, the handsome one has been subtly hinting that he needs more hats. And by subtle, I mean he's been saying, "I need more hats." 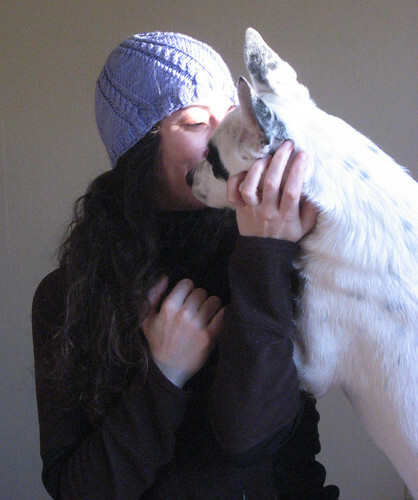 Leo wears beanies almost every day, and his favorites are soft, wool-free, and in a neutral colorways. Worked in Frog Tree Pima/Silk [85% pima cotton/15% silk] this little beanie bears a striking resemblance to the Carlsbad hat, only worked in a larger gauge. I need to get a shot of him actually wearing the hat. Right now, this dark, blurry shot of Leo (and the hat) watching me teach Madeline to salsa dance, is the best I can offer. Hey, you celebrate your birthday, your way, I'll celebrate my birthday, my way! And now that one hat is done, I've cast on another. 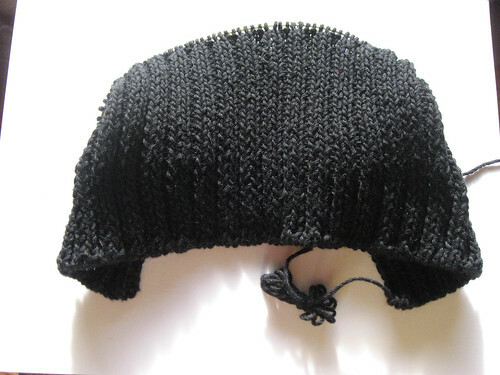 Beanie number two will be worked in solid black (same yarn) and entirely in 2x2 ribbing. This will be a variant of the Pismo hat. I think Leo will really enjoy wearing these hats, because the yarn is so soft, but the fibers aren't as easy care as some of the other hats I've made, so I'll probably be casting on at least one more design, in 100% cotton. My friend, Julia, was asking if I put elastic into my cotton hats. I never have and the hats don't seam to be any worse for the wear. Some negative ease seems to be enough for the hats to keep their shape. On the tatting front, I feel like I'm really getting a grasp of the basic. I'm certainly no expert, yet, but it's all starting to make more sense. These are the two types of thread I've been using. 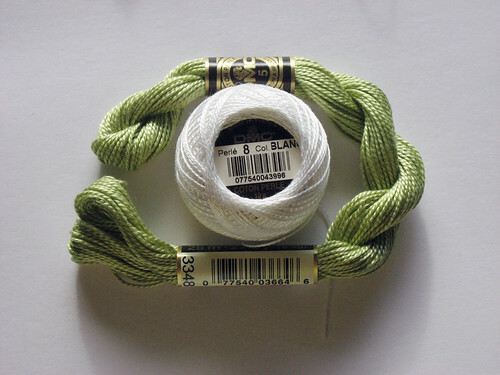 The green is standard Pearl (or "perle") Cotton. It's size 5 and seems to come in a huge selection of colors. The white is Pearl Cotton in size 8, which comes in little balls and is available in a much more limited color range. The craft stores have white, black and ecru, while a local needlepoint store had those and some primary colors. 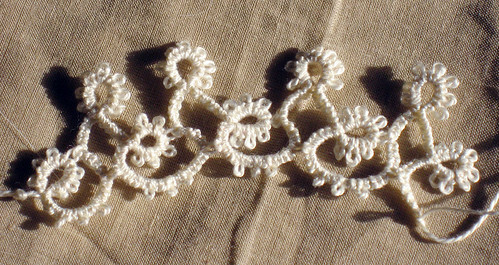 The latter produces very delicate little lace pieces, while the former really shows off the texture of the tatted stitches. They almost look like little beads, to my eye. I worked on this while riding the local public transportation and was really appreciating how portable it was. 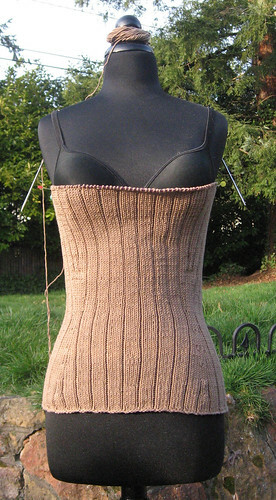 I was even able to work on it while standing, which I find harder to do with my bigger knitted pieces. Passing fancy? New passion? Who knows, but it's fun so far. 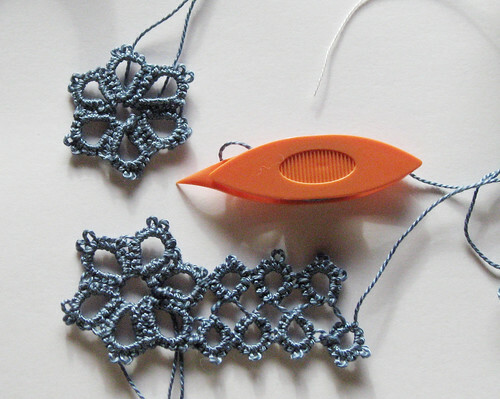 This page is an archive of recent entries in the tatting category. patine cowl is the previous category. sfNYE2007 is the next category.